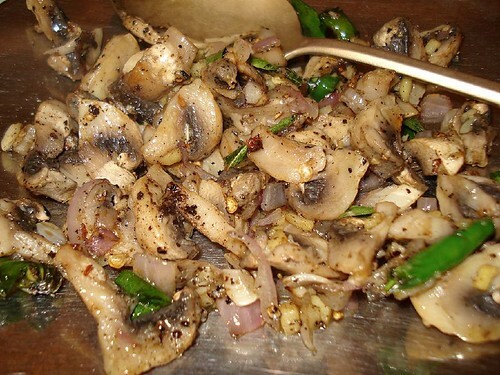 Mushroom Pepper Fry - sauteed mushrooms with pepper and onions, originally uploaded by Camemberu. Oh man, we are sooo late at discovering this gem just walking distance from home! The Mango Tree at Marine Cove specializes in cuisine from Goa and Kerala on India's southwestern coast. I'm not too familiar with cuisine from that region but it seems the food tends to be chili hot and fish/seafood dominates. The beachside restaurant is small and understated, but has a nice veranda for a view of the sea. Upon seating, they present you a lovely platter of complimentary plain and black pepper papadum with three dips (mint, mango and coconut chutneys). Our starter of mushroom pepper fry (S$7.90) was deliciously addictive - a sign of good things to come. A simple dish - just mushrooms, garlic, onion, green chili and lots of cracked black pepper - but oh so good! Beware the green chili though, they really bite! 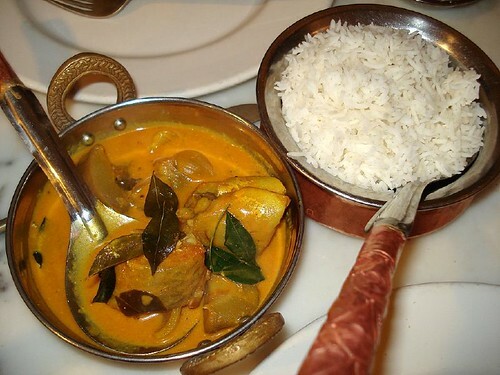 Allepey Fish Curry - mullet simmered in spiced gravy of coconut milk and green mango, originally uploaded by Camemberu. Hubby thought this was the best Indian food he's had in a long time. We chose the Allepey Fish Curry (S$15.90) as one of the mains. It is unusual, very mild yet beguiling. Still, not my favourite dish of the evening because of the use of mullet, which to me has a strong "fishy" smell by nature. 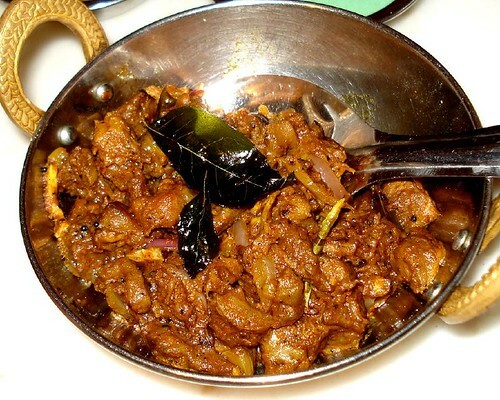 Erachi Ularthiyathu - tender mutton roasted with garam masala and diced coconut, originally uploaded by Camemberu. Now this was my favourite - Erachi Ularthiyathu (S$14). I was wowed by the harmony of the rich, complex spices in this mutton dish. The meat is genuinely tender and without any gamey mutton taste. Went so well with the basmati rice. Oh, I popped one of the green chilis into my mouth, thinking these larger ones would be less killer. 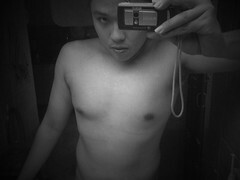 Boy, was I mistaken. Now, my tolerance for chili is pretty respectable (I can chew chili padi fine) but this fella took me to a new endorphin high. 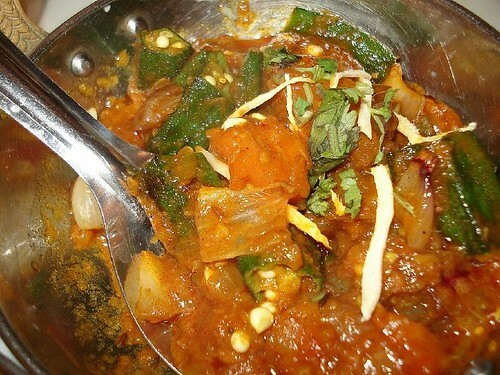 Bhindi Do Pyaza - okra with onions, originally uploaded by Camemberu. This vegetable dish, Bhindi Do Pyaza (S$8.50) came in a savoury tomato-based gravy. Interesting combination but I wished there was a lot more okra to it. Still, I mopped up the gravy with my rice and naan. Yum. 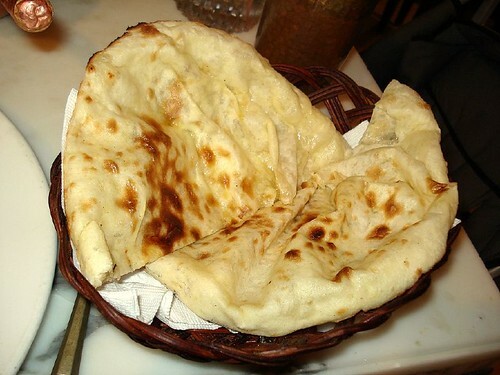 Cheese naan, originally uploaded by Camemberu. They serve fantastic, fluffy soft naans here (around S$3.80) - choose from plain, butter, garlic, cheese, even mango or machli (stuffed with seafood). Gotta try the last two next time! Coconut Kulfi, originally uploaded by Camemberu. The coconut kulfi (S$5.90) is beautifully homemade, with detectable chunks of sweet coconut flesh. The light dash of crushed pistachio adds to the nutty taste. 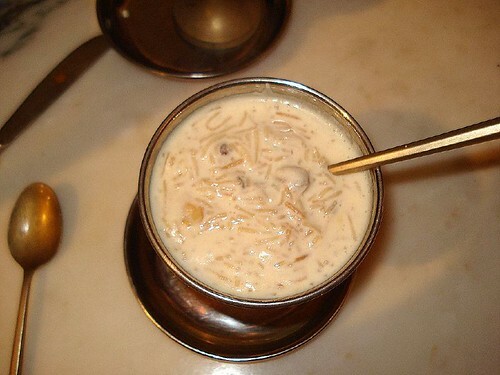 Semiya Payasam - vermicelli in milk with cashew nuts, sultanas, cardamoms and tropical fruits, originally uploaded by Camemberu. Now this is a dessert that I rarely see. Payasam (S$5.90). Served hot, it's a thick milky concoction that's both sweet and spicy. Fortunately not too sweet (as many Indian desserts tend to be). The small portions in the copper bowls may seem pricey but they're worth every cent. Good quality ingredients cooked with finesse. Service is equally genteel and attentive. They also have a full bar and wine list. We're bringing the whole family here next week. This sounds like a nice place for a simple indian meal. Sounds even better that the dessert is not too sweet. Most of the indian desserts are way too sweet. Yes, great food, lovely ambiance, wonderful service. Probably the best restaurant at Marine Cove! Looks very appealing, I should go try it one of these days. Ohhh, this is killing me. 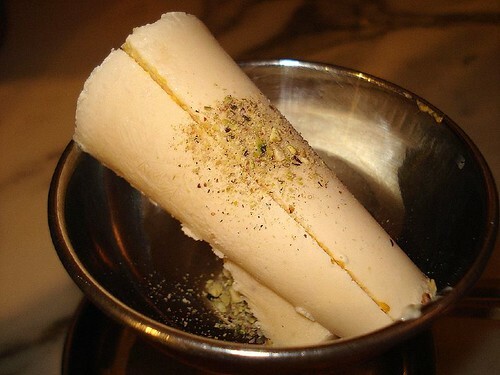 Everything, especially the kulfi, looks and sounds so delish! It's especially frustrating because I was just in Singapore last month!!! And now I won't be back till next year, aaaargh!!! payasam can be eaten cold too - had some for the first time tonight - yum!